Bloggers Roy Ngerng and Han Hui Hui lead a protest march against CPF policies around Hong Lim Park, while performances at a YMCA event were taking place concurrently. Shah Salimat is the editor-in-chief of Singapore entertainment, lifestyle and issues website Popspoken. He tweets at @firdianshah1. The views expressed are his own. Just recently, I found a Web article about an artist whose "invisible art" sold millions. The words were prefaced by a photo of artgoers looking at blank walls, trying to find the "art" that was presented by the artist. I shared it on my Facebook news feed, incredulous that such a gimmick made the artist a fortune. I then saw another friend sharing the same article. A comment under that post highlighted how the writers of the article came from a satire radio show that was fabricating articles and passing them off as news. I got trolled, big time. For some reason, I got the same feeling when I saw a video released by The Online Citizen showing a different view of the heckling that happened between Return Our CPF protesters Roy Ngerng and Han Hui Hui, as well as participants from an event held by the Young Men's Christian Association (YMCA). The ‘heckling’ – which actually consisted of disruptive chanting of ‘Return our CPF’ – made the news because, well, surely anti-government protesters would be exactly the type of mean-spirited, heartless people that would heckle special-needs children, right? Unlike the many who were quick to shower a barrage of curse words and similarly-powerful words of hatred towards the duo, I had my reservations. Blame it on my part-cynic, part-hopeful persona, but I had a reason to believe that humans still have a shred of kindness in them not to chastise special-needs kids. And so, question, I did. The fact that the video in question showed the ‘heckling’ just as the children went up-stage was highly suspect: if the protestors really were heckling, they would do so for a longer period. There was also some form of a chant that was different than what Han's camp was chanting. That was when an observer account on The Real Singapore and a video by The Online Citizen added another perspective. The account said that there was initial provocation from YMCA event attendees who were chanting "We Love Our CPF". Some of the attendees were grassroots leaders from the People's Action Party who had accompanied guest-of-honour Teo Ser Luck to the event. Further involvement in the chanting from a PAP representative accompanied this narrative. The video by The Online Citizen proves the observer account. As the protesters moved in to the YMCA event area, notice that the special-needs children were not on stage yet and did not do so for a while. This made one point clear: the heckling was to counter initial chanting from the YMCA event participants and was not directed at the special-needs kids. Then, when the children took to the stage, notice how a few people already filming the event started to pan their cameras between the kids and the protesters. Seconds later, the marchers left as the kids start to perform. The video's unfortunate panning and selection of recording time did the duo of Ngerng and Han in. It does seem clear that the protesters did intend to engage with the minister. 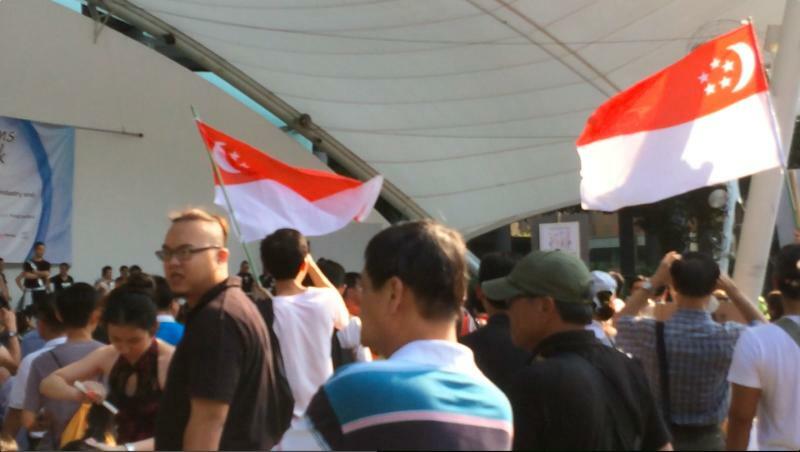 The march was done with the minister in sight – Ngerng’s explanation note on his blog stated that the crowd did intend to capitalise on the opportune appearance by Teo to push the message. However, he explained that their disruptive chanting was not directed at the special-needs kids. Granted, heckling is reprehensible. Shouting at anyone, let alone special-needs children, is reprehensible. However, why was it that the public and the media were quick to accept the one and only form of evidence as the one telling the only story? Is it that, in the age of point-and-shoot, a 20-second video is enough for a rounded news piece representative of an event? Or are we developing into an unthinking society, quick to comment but slow to nitpick? We should consider other evidence before drawing conclusions. The lack of awareness on cross-referencing among Singapore's netizens is frankly very disturbing and speaks volumes about how we're too fast-paced to even do a proper fact-check. So now that we know there is more than meets the eye to the heckling story, maybe we can start to look at things from a more rational point of view instead of spewing hate on two figures that are already vilified by Singaporeans for causing trouble. The next time you believe something, flip a coin. There is always another side.